We are pleased to announce the Third Annual BYU New Testament Commentary Conference will be held on Friday, July 31, 2015, 9 a.m. to 4:00 p.m., in the Hinckley Alumni Center at BYU. This conference is free and open to the public. Videos of every presentation will be made available on this website within a couple of months. We are celebrating the upcoming publication of the newest e-book in the New Testament Commentary Series, which is Paul’s First Epistle to the Corinthians, by Richard D. Draper and Michael D. Rhodes. Everyone who attends the conference may register for a free copy of this e-book. First Corinthians has long held a prominent place in LDS thought, culture, and practice. It is the source of the Relief Society motto, Charity Never Faileth; and Paul’s discourse on the gifts of the spirit stands behind Article of Faith 7. Featured speakers this year include Craig Blomberg, Kevin Barney, and Julie M. Smith. Craig Blomberg is Distinguished Professor of New Testament at the Denver Seminary and co-author of How Wide the Divide? A Mormon and an Evangelical in Conversation. Kevin Barney practices public finance law in Chicago and is a scholar of Mormon history and scripture. Julie Smith holds a master’s degree in biblical studies from the Graduate Theological Union at Berkeley and is the author of several published works. Richard D. Draper and Michael D. Rhodes will lead a panel discussion about their commentary on 1 Corinthians as well as respond to questions from the audience. 11:50 Lunch Break: We recommend the buffet at the Cannon Center at Helaman Halls or the food court at the Wilkinson Center, or you may bring a brown bag lunch to eat on the west patio at the Hinckley Center. Parking: No one attending the conference may park in the few reserved spots available directly across from (east of) the Hinckley Center. Please park at the Museum of Art visitor lot (open during construction), or in Lot 48, which is just under the south scoreboard of the stadium, and a short walk from the Hinckley Center. If you have a handicap hangtag, you may park in the “A” lot across from the Hinckley Center, but not in the reserved spots. 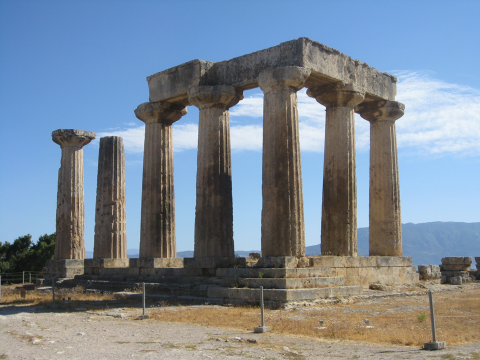 Ruins of the Temple of Apollo at Corinth, Greece. This entry was posted in 1 Corinthians, Conferences on July 1, 2015 by Administrator.